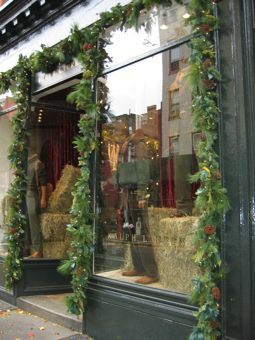 This is one of the Ralph Lauren stores at Bleeker and Perry, where I am very very very lucky to live. I still can’t get over how Bleeker Street has changed. I have to say, even though I can’t afford to shop in any of these stores I love having them here. They are very pretty and I enjoy looking at the things in the windows. Don’t you love the holiday look here? Cynthia Rowley, across the street, is into this amazing shade of blue right now, and it’s running through everything in the window and the store. Alas, although the Marc Jacobs stores make a big effort with their windows, they are usually not a success.